The sensational tacos and puffy tortillas hechas a mano, or, hand made corn tortillas, of Soho Taco Gourmet Taco Catering , savored recently at a party hosted by Anita of Mad Hungry Woman for 40 of her food writer, blogger, and social media guru foodie friends. I’m not really embarrassed to tell you that I ate 5 tacos – we were there to sample their tacos after all, and I aimed to do Soho Tacos justice by trying as many as I could. I enjoyed all but the mahi mahi fish taco – just too stuffed by then. The first two tacos Chef Gabe prepared for guests were shrimp and chicken. Succulent pre-marinated shrimp was tossed on the grill for a quick minute or two and guests could enhance them with one or more homemade fresh salsas and sauces. 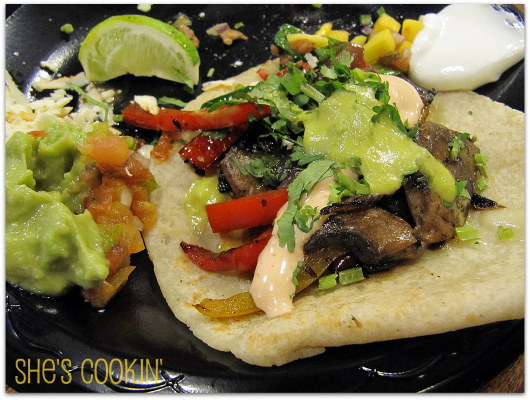 When they ran out of shrimp, the offering changed to Carne Asada and grilled portobello and vegetables (pictured) . I’m not a vegetarian or a big fan of vegetarian tacos, but the meaty flavor of the portobellos and the sweet red bell peppers had me declaring this my favorite of the evening – even after squeezing in a carnitas taco (my usual favorite), the final selection of the evening along with fresh grilled mahi mahi. Lucky attendees received a mysterious invitation titled “Anita Unveils Here Secret Lover” (like we needed any other incentive); we knew this was an event not to be missed! 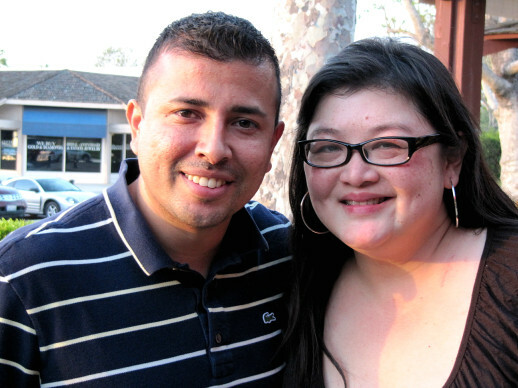 Soho Tacos was delighted to introduce Anita’s friends to their gourmet tacos, after all she’s been raving about Soho’s tacos since discovering them at a Newport Beach event she crashed last year. Chef Dee Nguyen of Break of Dawn Restaurant in Laguna Hills graciously provided the location and Big Train generously donated samples from their broad line of refreshing beverages: agua fresca, horchata and jamaica drinks as well as mango passion fruit green iced tea. 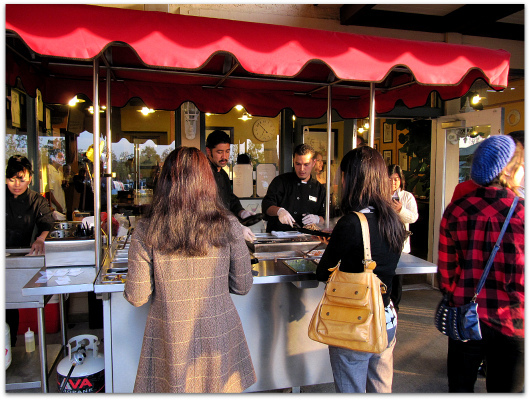 Soho Tacos showcases their culinary delights with a clean and modern taco cart which is designed for any kind of social event, from family gatherings, corporate events, and anything in between. We left that evening of fun and food, brainstorming ideas for a reason to throw another event so we could have more Soho Tacos! 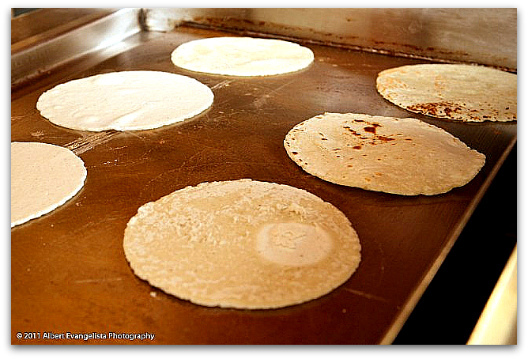 Tortilla photo by Albert Evangelista Photography. Are you in on the food truck craze? 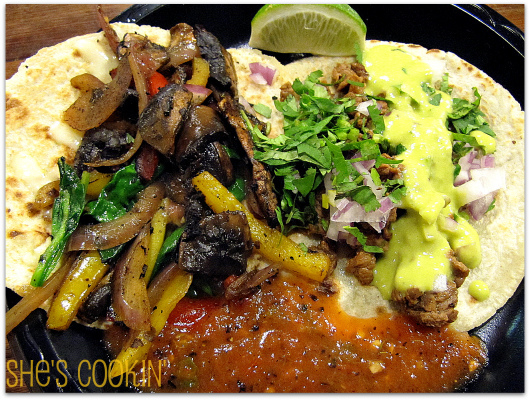 Those tacos …wow…I can see how they can become an obsession! A dozen, pleeeeeeeeeeeease! Who wouldn’t get hooked with those gorgeous tacos! Those tacos sound terrific, great flavor combinations. I love Tacos, and yours look scrumptious! Now those are some good looking tacos! Love the toppings and I bet the fresh tortillas are fantastic. I could have probably done 5 as well 🙂 What a great and delicious event! I could have 10 of the portobello & veggie! YUM!